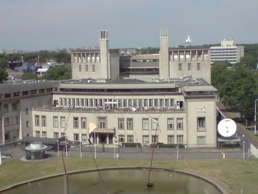 Research for my second novel took me to the International Criminal Tribunal for the Former Yugoslavia (ICTY) in The Hague this July. The photograph shows the view from my 8th floor hotel room window. I sat in on the trial of Radovan Karadzic and a number of other accused war criminals. The novel (still untitled) is about a TV soap star whose prior involvement in the Bosnian conflict as a member of a touring theatre company brings him to the point of mental collapse. The story is told in part through the eyes of puppet and object “characters”, including an inhumanly cruel marionette. At a conceptual level, the book explores the status of performing objects as expressions of the darker side of human nature. Other research undertaken for the project includes reading around the subject of puppetry and “object theatre” (The Secret Life of Puppets by Victoria Nelson and Dumbstruck by Steven Connor are examples) and attending the 2009 Suspense Festival and the 2011 Manipulate Festival in Edinburgh.